Hrair Sarkissian’s Horizon. Photo courtesy of Sursock Museum, Beirut, Lebanon. Inside a dark room on the ground floor of Beirut’s Sursock Museum is a light blue screen. Projected onto the wall, and reflected onto another screen in the middle of a black carpet below, a film documents a journey taking place across a large body of water. In the distance lies an unidentifiable landmass that is easily seen but, despite moving forwards, never appears to get bigger. Why is the film heading in this direction, and what lies on this island? There are no signs of human life; the sea is free of any other vehicle, although it is clear that, wherever this journey leads to, it is happening by boat. It is possible that those on board this ship do not know what lies at their journey’s terminus. This film, titled Horizon, is one part of Hrair Sarkissian’s Homesick—a two video installation displayed as individual halves, documenting the journey taken by those fleeing conflict across the Mycale strait from Kas in Turkey to the Greek island of Megisti. Many Syrian artists have been forced to leave their homeland, relocating across the Middle East and further afield to find safety, unable to come back home. Sarkissian, for instance, left Damascus in 2008 and has not returned to Syria since. Across the corridor, opposite tranquility, a more violent and destructive pair of films play in a similarly dark exhibition space. Projected onto a large screen on the central wall is a house in Damascus. The family home is falling apart, with parts of the building crumbling into dozens of pieces as its foundations struggle to support itself. This building is a model of Sarkissian’s childhood home in Damascus. To the right, on the adjacent wall, the artist can be seen violently attacking something with a hammer. We are unable to see what he is striking, but by being positioned so close to the projection of the damaged house, it is almost certain that he is destroying his former abode. In the film he appears distressed, annoyed even. The anger that he has manifested on screen and through violence may even be a result of complete despair. As is reflected in the exhibition guide, together the films are: “both an act of catharsis and reclamation of agency at the same time: to destroy before others destroy you.” What makes the whole sequence even more impactful, is knowing that Sarkissian’s parents still reside in this Damascene house. Hrair Sarkissian’s Homesick. Photo courtesy of Sursock Museum, Beirut, Lebanon. The exhibition in Beirut is a response to the war in Syria. While the two parts of the installation appear to juxtapose each other with one being aggressive, and the other being comparably gentler, together they portray a sense of loss and trepidation. While Horizon seems lighter on the surface, in reality, it is just the beginning of an ongoing journey that is often unfamiliar and dangerous: the beginning of life as a refugee. Sarkissian’s exhibition in Beirut is just one display of the situation of Syrian artists in Lebanon. In Aley, only 15km north of Beirut, lies an art residency programme that provides a space for Syrian refugees living in Lebanon to create artwork. Art Residence Aley was set up by Raghad Mardini in 2012: "It’s a space of freedom and hope for every young Syrian artist," she says of the project. The programme occurs inside a 200-year old stable, which Mardini discovered in ruins in March 2011. The building had been destroyed during the Lebanese civil war, but Mardini, who had trained as a civil engineer, saw beauty in its remains. After a year-long restoration effort, Art Residence Aley opened its doors in April 2012. Much like the Syrian situation, Mardini describes the restoration project as emblematic of the artistic programme that now takes place in its grounds: "I saw the opportunity to turn the stables into something beautiful and also symbolic: ruined and in trouble but still possessing an inner beauty it was impossible to mistake, and which the right amount of love and energy could revive into something productive and new." Art Residence Aley hosts artists for four-week residencies, providing the materials and daily necessities required for producing artwork and allowing artists to interact with each other. The non-profit organization has created a collective community of Syrian artists from different regions and different religious and social backgrounds, who live together peacefully in the renovated stables in Aley. In Art of Resilience, a film about the programme, Mahmoud Majdal, who was a resident in December 2013 says: ‘This place was like oxygen to me with its spirit, people. This place has freed me.’ Coming from a zone of conflict, danger, and uncertainty, it is no surprise that the displaced artists, who make Aley their home, are re-energized inside its walls. Not only does Art Residence Aley provide a space for art making, but it also commissions projects for young Syrian artists, and exhibits the artworks produced during the residencies in galleries across Lebanon and abroad. 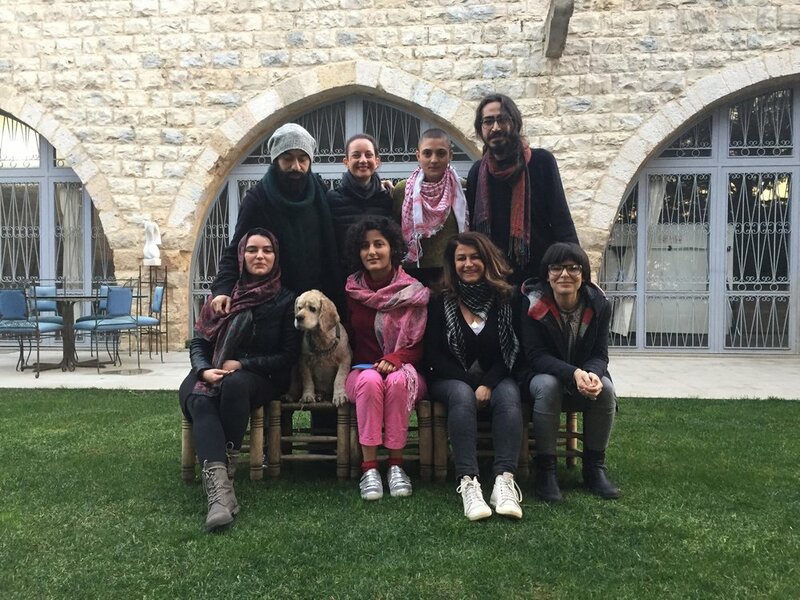 At the end of their stay, each artist leaves one artwork for Art Residence Aley, allowing the organization to build a unique collection of Syrian Art during a critical moment in Syrian history. The artists who stay in Aley are not only encouraged to interact with each other but also the broader local community, creating an on-going interactive platform between Syrian artists and the world: "It pushed me to create more, the residence was my release," says Rabee Kiwan (June 2012). Art Residence Aley has collaborated to exhibit in Lebanon, Jordan, and Kuwait, and has also hosted poetry evenings, film screenings and performances. Art Residence Aley has also recently generated an extension to the project in Lebanon, in Litehouse Gallery London, exposing Syrian artists to western audiences. Three day interactive performance art workshop at Art Residence Aley (ARA with Marta Jovanovic December 2014. Photo courtesy of ARA. Untitled 2014, 50X20X15, Bronze statue by Mwafak Maklad, a young Syrian artist. Photo courtesy of ARA. 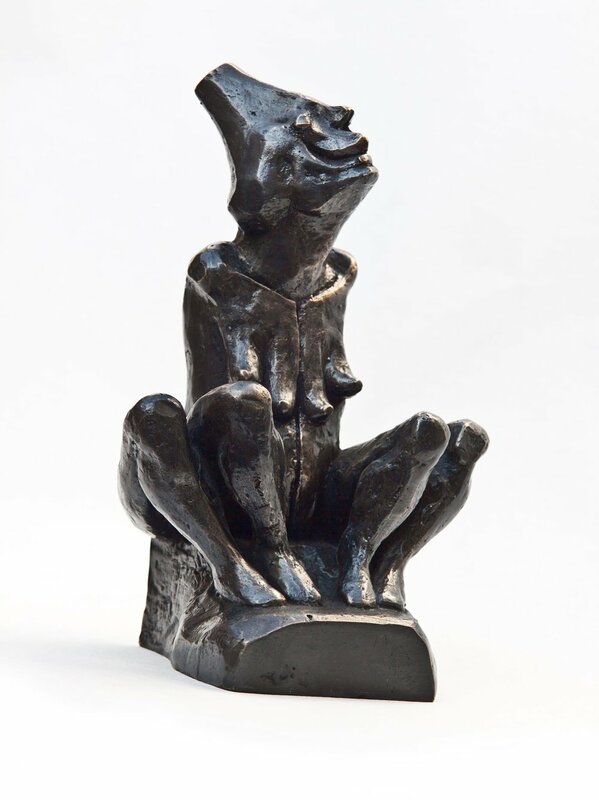 Untitled 2014, 80X20X10, Bronze statue by Mwafak Maklad (from Sweida born in 1988). Photo courtesy of ARA. In On Paper 2012, by Gylan Safadi (from sweida Born in 1977). Photo courtesy of ARA. Untitled 2013, Bronze statue by Mohamad Omran (Damascus-born, 1979). Photo courtesy of ARA. Litehouse Gallery was born following Mardini’s decision to relocate to London with her children in 2015. On arriving in the UK, Mardini realized there was a gap to fill in representing Syrian art and artists in London, where they had been overlooked despite being highly appreciated in auction houses. She went on to take further study, gaining a masters degree in Museums, Galleries, and Contemporary Culture with the aim of developing a space for Syrian artists within the London market. While Art Residence Aley remains in operation in Lebanon; in the UK, Litehouse Gallery is a platform that is becoming a central hub for Syrian artists in London through cooperation with local institutions. Having launched formally in February 2017, Litehouse not only operates as a gallery but also has an educational strand, organizing talks, workshops, and exhibitions to increase the exposure of Syrian art. Litehouse is the only gallery in Britain dedicated to showcasing emerging contemporary artists from Syria. The space also functions as a platform to engage in new ideas and perspectives, aiming to form dialogues with diverse audiences. Activities touch upon subjects of politics, war, exile, dreams, and visions, which portray the real image of modern Syria, bridging British and Syrian cultures through collaborative educational programs and workshops with artists from both backgrounds. Litehouse is forming a strong identity that stands for freedom of expression and integrity, addressing the misconceptions that surround Syrian people and their present predicament. So far exhibitions have taken place at the Arab British Centre as well as in the residences of private London-based collectors. The gallery has also participated in conferences globally, most recently in Japan. Echoing Litehouse’s introduction of contemporary Syrian artists to London earlier this year, the British Museum has acknowledged the value of contemporary Syrian art in an exhibition of artworks on paper titled Living Histories. The show includes posters, prints, drawings and photographs that are, as the exhibition’s title indicates, living histories. The powerful works speak of their time, confronting the audience with the Syrian situation from the perspective of those directly affected by the war since the beginning of the 2011 uprising. The most striking works on display are entirely anonymous. Alshaab Alsori Aref Tarekh (The Syrian People Know Their Way) is a collective of unknown artists who circulate posters digitally via social media platforms for activists to download and print for use in demonstrations and to paste on walls in public spaces. It is possible that the posters were never intended to be read as works of art at all. However, displayed in the British Museum, the political objects, which once required its primary audience to physically move the posters from the digital to the physical dimension, gain an additional layer of meaning and history. From having once been used to further political ideologies in the Middle East, they are now being exhibited behind a glass screen in Britain, confronting a western audience with a situation that most of them can't relate to. These posters, like Sarkissian’s film in Beirut, evoke violence, despair, and pain. Amongst the Alshaab Alsori Aref Tarekh papers on display in London, screaming faces, a bleeding Syrian flag, propaganda statements, and people in cages appear as a constant. The posters have been given evocative titles like The Struggle for our Sake, Prepare for Rebellion, and Self-Defense is a Legal Right and Freedom. The prints evoke desperation and suffering, presenting the viewer with a powerful manifestation of emotion that cannot be ignored or overlooked. Multiple Alshaab Alsori Aref Tarekh posters on display at the People’s History Museum's Never Going Underground exhibition (March to September 2017). Photo courtesy of Oliver Bliss. Also on display in the British Museum exhibition are works by Fadi Yazigi on rice paper. "I can’t stop working: art is not only part of my survival – but it’s also a way of looking for a solution," says Yazigi. The artist displays eight characters in eight different contorted positions. Their posture is strained, and their poses appear uncomfortable, but the expressions on their faces seem light, some are even smiling. By using rice paper, the artist, who still lives in Damascus, demonstrates his perseverance and determination to continue to create art despite the struggles and hardships during a time where art supplies are limited and difficult to acquire. Displayed alongside the works on paper at the British Museum are two sculptural series by Issam Kourbaj. Dark Water, Burning World, consists of a fleet of miniature boats that have been constructed out of "burned matchsticks and the mudguards of old bicycles." They echo the voyage documented in Sarkissian’s video, except this time what the viewer is presented with is not so calm, or easy on the eye. Instead of pale blue, clear waters, Kourbaj exhibits burnt-out matchsticks and fragile vessels that have been battered and bruised. The dangerous materials from which these boats have been made illustrate the desperate measures and lengths people go to to escape the war. Born and trained in Damascus, Kourbaj now teaches at Cambridge University, yet his work is deeply tied to his upbringing in Syria and the destruction of his cultural heritage. The installation of boats in the British Museum reflects the terrifying passage made by Syrians fleeing violence via the sea between Turkey and Greece, while the artist’s choice of material stresses the severity and desperation of the journey made by those left with no choice but to flee from their homeland. Alongside Kourbaj’s tortured ships is a set of objects that are incredibly harrowing. Lost consists of clothes that have been dripped in plaster, turning soft, protective garments into hard, lifeless phantoms haunting the exhibition space. On top of the cold, white clothing inscriptions are written in Arabic and Greek, reflecting the languages spoken in the departure zone and the arrival destination. These garments are lifeless ghosts that represent true horror. They are the remnants left of children who have lost their lives while attempting to reach safety in Lesbos. While Lost is an alarming and shocking illustration of death, it is also a frank and honest comment on the reality of real consequences met by those desperate to escape war. During this summer’s Shubbak Festival in London, Kourbaj also presented a one-day installation/performance entitled Unearthed. The work involved laying down hundreds of old hardback books across the floor of the British Museum’s Great Court. These books had each been marked with a single black line, reflecting the Syrian tradition of mourning the deceased in photographs by placing a black line over the dead. As a result of the conflict in Syria, many lives are being lost without ever being mourned. Through his performance, Kourbaj symbolically grieves the lives that have been lost to the war. Throughout the daylong performance, the number of books laid across the museum floor increased to a shocking degree, confronting the predominantly British audience with the reality of death in the artist’s region. From Sarkissian to Kourbaj, dozens of Syrian artists who have been forced to leave their homeland are finding ways to make art that illustrate their predicament. By using a visual language to communicate what is often too complicated to tell people with words, these artists visually inform their audiences of the realities faced in an urgent situation. Lizzy Vartanian Collier is a London-based writer with a special interest in contemporary Middle Eastern Art. She has a BA in Art History and an MA in Contemporary Art and Art Theory of Asia and Africa from the School of Oriental and African Studies. She runs the Gallery Girl blog and has written for After Nyne, Arteviste, Canvas Magazine, Harper's Bazaar Arabia, Ibraaz, Jdeed Magazine, ReOrient, and Suitcase Magazine. Lizzy is also curator of Arab Women Artists Now - AWAN 2018 (London).